Having recently found some time to delve into “What does it takes for my client to move away from existing Business Objects Universes to adopting custom OBIEE repositories”, I thought of developing a strategy that I can adopt and share that with you all out there trying to accomplish the same.. Of course my client is the first one to review or may be I will be reviewing with you so we can discuss further and I can submit a refined strategy to my client. First of all, as of this writing, lets make sure that we are on the same page that there is no automated tool that was developed to move a BO universe and convert that into a OBIEE repository. With this premise set, we need to walk through various features that are supported in Business Objects and lets see how we can convert them into OBIEE. I will try to keep adding more to this as I encounter new terms in my BO to OBIEE migration project. Now, lets look at Shared Filters in OBIEE. 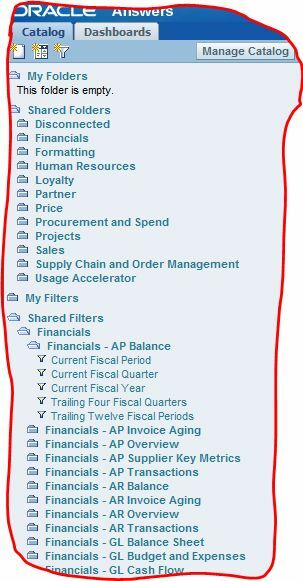 ‘Shared filters’ here are nothing but ‘Saved Filters’ in ‘Shared folders’ of your Presentation catalog folders and these filters as in Business Objects can be applied across all your answers requests. Lets see how many of them are available in Financial Module of OBI applications analytics package. wow… this concept has been extensively used by Oracle..
Now lets look at what “Current Fiscal Period” filter looks like. This is nothing but a regular filter saved in a shared folder so that you can reuse across all your reports/answers. 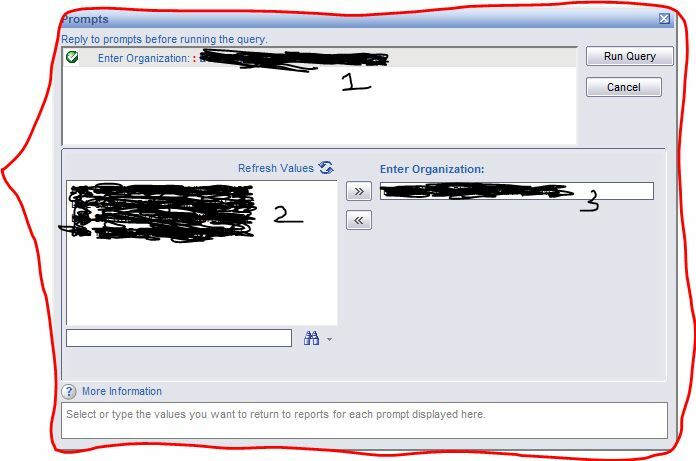 So, we covered both “Shared Filters” and regular “Filters” in one shot..
Moving onto Prompts, in Business Objects prompts are created at the report level where as prompts in OBIEE are created at the dashboard level. 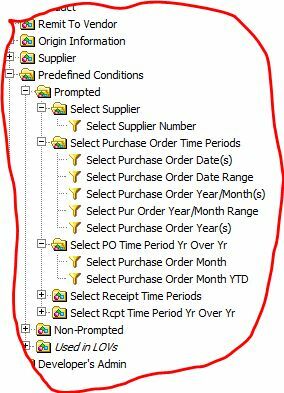 Can we not create prompts at dashboard level in Business Objects (BO)? Answer is Yes but I am just giving you a common practice of most how it was frequently used. Think of a WebI report and a prompt at the report level. This is the scenario we will cover first. See the region marked 1,2, 3 in the above pic. 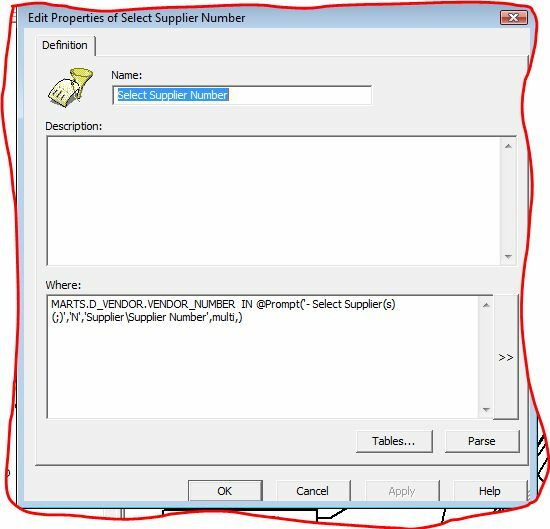 Region 1 in above pic –> Enter organization is the prompt description and the black marked area in 1 region is what the default value that is being passed to this prompt. Region 2 in above pic–>List of values for the organization that can be populated from the database when you click ‘Refresh Values’ on top of region 2. Region 3 in above pic–>Values chosen from List 2 that you want to pass to the organization prompt. Once you click “execute query” , these values that you see in region 3 are passed on to the BO server for execution. Enough said about the BO prompt, lets look at a dashboard prompt that comes with OBI Applications Analytics as we saw before. See the dashboard prompt above .. when you click on .. next to each text box for each of the different columns which are part of this prompt. You can choose your values just like as you did in Business Objects (BO). This below picture shows how you can select your values for a dashboard prompt..